All our shafts are made from the highest quality Canadian maple. This maple is specially selected, cutted,sawed and turned on behalf of a straight grain. The "V" shaft This shaft is standard supplied with our new cues, it has a slightly slimmed shape and can be used for both free game/balkline and three cushion. The "R" shaft Extreme stiff shaft, straight conic shape. This shaft is over the whole length more slimmed and because of its shape more flexible. A very handsome shaft for free game and balkline. 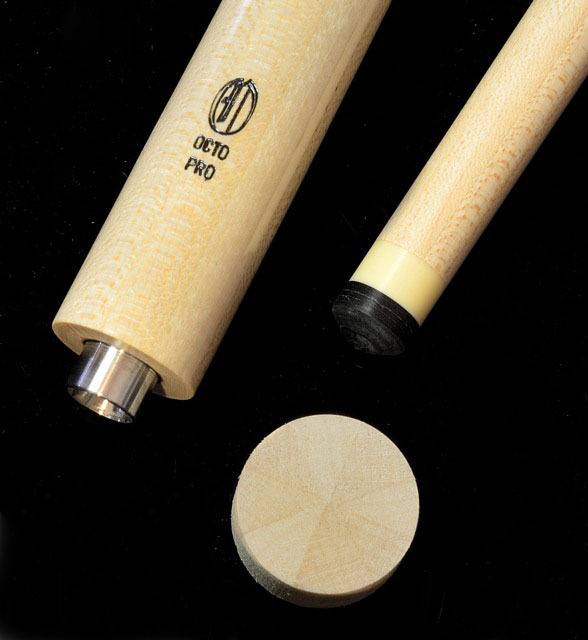 We produce a similar shaped shaft in high density maple (for balkline) and for three cushion in the laminated version. The "W" shaft A bottle-like slimmed shaft which gives extreme penetration in the cue ball, keeps its stiffness although feels as a slimmed shaft. Exclusive produced in high density maple and laminated maple. The "P" shaft This shaft is originally designed for our pool cues, according to the most popular shape among professional pool players. Also often used in carom by artistic players for shots where the cue ball is very close to the object ball. Radially laminated shafts are typically known for being stiffer than non-laminated shafts.